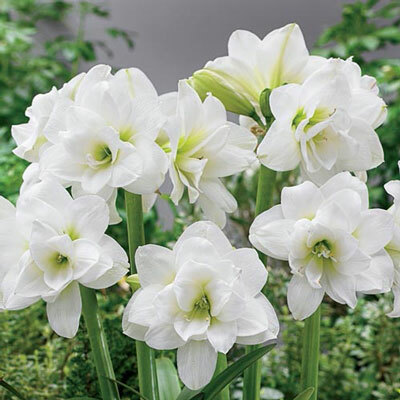 Double flowers, pure white with green centers. Plant groups of these hardy and exotic perennials and come late spring, the landscape will be filled with lush, colorful single or double blooms that really dazzle. Fantastic in containers and floral arrangements, too. Remove spent flower stalk after blooming. 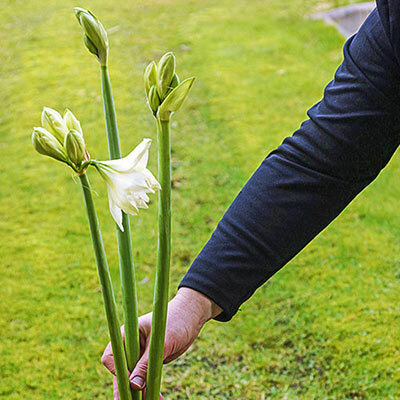 Allow foliage to dry out before removing to allow energy to be stored in the bulb for next year's bloom. Reduce amount of water given around early August, allow bulbs to ripen and go into a dormant state for 6-8 weeks. Bring out of cool dark storage after 6-8 weeks to begin growth. Water sparingly until the bulb develops leaves or flowers, then water more when necessary.